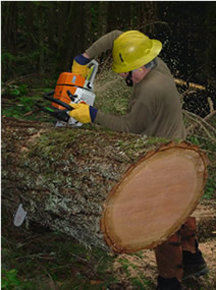 A man using a chainsaw. Notice all the safety equipment, and his obvious focus on what he's doing. If we all paid as much attention at meetings as he's paying to his chainsaw, meetings would be far more effective and produce far more valuable results. Photo courtesy U.S. National Park Service. It's OK to hate meetings. It's not OK to hate meetings while at the same time doing the very things that make them so unproductive and hateful. Last time we examined some meeting patterns that distract us by creating or contributing to toxic conflict. This Part II explores distractions that waste time through irrelevance or by hijacking the meeting agenda to personal ends. To advance a previously blocked project of their own, or to inject an I-told-you-so, some make contributions that have the not-so-hidden purpose of advancing their previously blocked projects. The group must then knock down this obstacle before it can begin problem solving. Horn-blowing is making a contribution that reminds the group of something the horn-blower considers to have been his or her own personal achievement. See Backdoor Bragging. Rhetorical fallacies are errors of logic, used intentionally or not, that cause the group to come to erroneous conclusions unknowingly. There are dozens of different fallacies. Read about a few of the more common rhetorical fallacies. If you want meetings to be worthwhile, give them your full attention. Composing or reading mail, texting, tweeting, surfing, or other forms of electronic fiddling around can cause us to lose contact with the discussion. Follow the chainsaw rule: If you can't do it while operating a chainsaw, don't do it while attending a meeting. Once the group identifies a problem, the temptation to dive into solving it is almost irresistible, even if complete information is lacking, or the group doesn't own the problem, or critical people are not in attendance. See "The Solving Lamp Is Lit," Point Lookout for September 6, 2006, for more. Even when we're solving a problem that is ours to solve, and even when we have the people and information we need, we can be distracted by the urge to solve it in an optimal way. Most of the problems modern organizations face don't actually have optimal solutions. Solutions have strengths and weaknesses, depending on our goals. There usually is no single best way. See "Holey Grails," Point Lookout for October 23, 2002, for more. Optimization, described above, entails discussing the best way to do something. Meta-optimization is a discussion of the best way to discuss optimizing something. A group that regularly gets so distracted that it enters a meta-optimization discussion is a group in need of distraction training. Would you like to see your comments posted here? rbrensgzuviMUnTfIRxIzner@ChacxZqOGndkazUfhDYFoCanyon.comSend me your comments by email, or by Web form. Although many believe that "You get what you measure," metrics-based management systems sometimes produce disappointing results. In this Part II, we look at the effects of employee behavior. I offer email and telephone coaching at both corporate and individual rates. Contact Rick for details at rbrenIKHXoTGmOnPSBQjFner@ChacSCdVxMbFIRXlhASMoCanyon.com or (650) 787-6475, or toll-free in the continental US at (866) 378-5470.